You can't talk about the "soul food" of the American South without mentioning grits! A Southern staple, this "porridge" made from coarsely ground hulled corn is great as a side dish or served in casseroles. In fact, entire cookbooks are dedicated to this "polenta of the States." 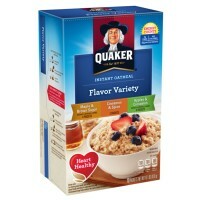 Quaker makes grits easy with their Quaker Quick Grits. Cook 'em up in a minute and savor the flavor"¦ but don't forget the butter! Stir in 1 part mix with 3 parts water. Salt to taste. Cook in microwave for 3-4 minutes. White hominy grits made from corn, reduced iron, vitamins B3-B1-B2-B9. Contains GMO. Nutrition facts (for 100g): calories 351Kcal, total fat 1.4g (saturated fat 0g), total carbohydrate 78.4g (sugar 0g), protein 8.1g, salt 0g. I'm from México but i was living in louisiana usa for18 years. They serve grits everywhere in places like mc'donalds hardees now i'm back home México i hope i'll find some grits here.. I am living in Berlin, Germany and I am so happy to satisfy my american heart with the best thing you can put on the breakfeast table to your Ham and eggs and some good old toast. Thank god there is the american market! They have the products the people want. AAAAAAnd the price is pretty good for export. So again, thank you the american market. I hope everything stays like that! Finding My American Market is like finding an oasis in the desert. All my favorite foods from back home in the States can be found right here. I've been eating grits for as long as I can remember and to be able to get them again here in Europe is great. A big thank you to the entire team! 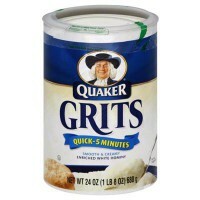 I do enjoy grits for breakfast! I especially love grits for my winter breakfast. 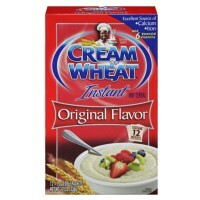 I alter the menu from day to dayor week to week: grits, oatmeal, cream of oats, and cream of wheat. Preparation is done in the microwave while I fire up the wood- urning stove (poêle), and then I return to bed with a hot espresso and a big bowl of hot cereal! I love my grits for breakfast. Easy to make & good taste. 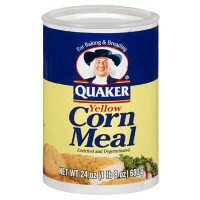 I love that I can order these quick grits from AM for such a great price! Shipping is super fast, everyone is super friendly and I love the surprise gifts that came in the box. As far as the expiration date goes, my great grandmother that lived through the Great Depression and lived to be 96 years old? Well, she always told me that expiration dates are a modern tool driving consumerism in a way that makes people imagine that they have to throw good food away and buy more, so that companies will make more money. She always taught me how to store food to last and get the most out of it. So, I transfer these grits to an air tight container, and based on my experience, they will easily stay good for over a year that way, regardless of the date on the can. I add butter, bacon, cheese and a sunny side up egg and they are delicious! 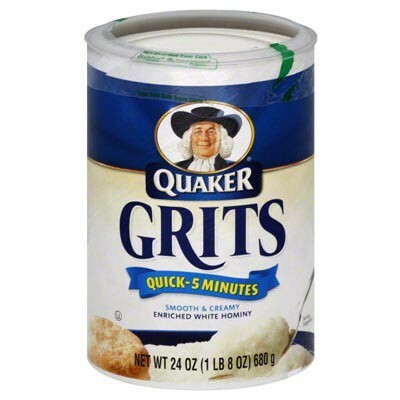 I go threw about 5 of these containers over one winter time with my family, so anyone that really likes grits like I do - they won't last long, so don't worry about any date on the can! Thank you, AM! Super easy to make and delicious to eat. I LOVE AM! I love this product. 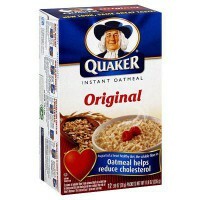 Because of nickel allergy I can not eat oats, and have therefore not had oatmeal in almost 30 years. Now I get something that is sooo close. Love it. And great to be able to order it in Europe. LA PRIMERA EXPERIENCIA EN ESTA TIENDA. TODO MUY BIEN, DESDE LA COMPRA HASTA LA ENTREGA MUY RAPIDA Y COMODA. EL PRODUCTO UNAS GACHAS CON LECHE MUY MUY RICAS, ME ENCANTAN. buen producto. lastima el margen de caducidad no es muy amplio.